The Galaxy Coral is a delicate beauty, and a great focal point in a spacious reef aquarium! The Galaxy Coral Galaxea fascicularis is a popular large polyp stony (LPS) coral that many reef enthusiasts have or want in their collection. It has a very delicate and brittle skeleton, but it is quite attractive. 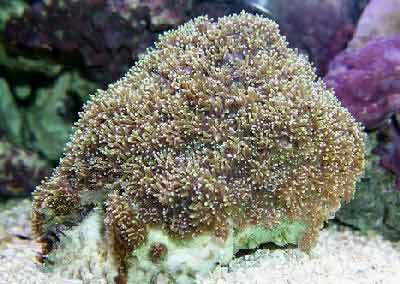 Its polyps resemble a star burst and are tipped in white, give it a sparkling crystal-like appearance. The tentacles have a mesmerizing movement to them as they undulate in the aquarium. Common names it is known by, reflecting some of those great characteristics, are the Star Coral, Crystal Coral, Brittle Coral, Starburst Coral, Scapel Coral, and Durian Coral. In the wild Galaxy Coral colonies are massive with mostly columnar or encrusting forms, but shapes that include spires and branches are also sometimes found. They are common in many environments, and often dominate inshore fringing reefs to the exclusion of all other corals. Their lightweight skeleton consists of groupings of branching tubular corallites connected together by tiny little bumpy plates. The outermost parts of this formation is then covered in living tissue. This makes for a delicate and easily broken structure, so it must be handled with care. The colors this coral comes in are green, red, brown, gray, and pink, as well as mixtures of these. The outer tentacles that extend from each corallite tend to be clear or translucent, with tentacles becoming more opaque towards the center. They are often tipped in white, or sometimes a lighter variation of their colors. The polyps range in size, up to 6mm in diameter. Tentacles are often extended during the day. The Galaxea genus can be moderate to easy to care for, especially if they are aquacultured specimens. Due to their delicate skeleton, specimens that are imported can suffer a lot of damage which can lead to infection. However imported corals have many commensal creatures that live between the polyps such as crabs, mussels, sponges, and shrimp. It is actually quite a privilege to acquire a Galaxy Coral with these creatures. Provide the Galaxy Coral with good light and a low to moderate water movement. Coral skeletons are its substrate of choice as it will encrust these. It can extend very long sweeper tentacles, over 12" (30 cm) in length, that pack a pretty strong sting. Keeping a low water flow will help minimize the length of these. Keeping it fed is also a good way of keep them from "searching for food" with those little stingers. Provide an abundant amount of space between it and other corals to prevent its sweeper tentacles from damaging them, and for its own growth needs. The Galaxy Coral, G. fascicularis is quite hypnotic as it's tentacles sway in the water. Position your eventually 16.5" foot diameter coral away from other corals and have the moderate flow they need in a turbulent fashion. Have the flow push these tentacles that are sweepers, which reach up to 12" long, away from other corals. Moderate to high light and mid to top positioning is their sweet spot. Galaxea paucisepta is another species of the Galaxea coral under the "Galaxy Coral" name. Colonies are small and encrusting, forms flat horizontal plates (laminar) with corallites that are 2.5 to 3 mm in diameter and tentacles are gray or greenish brown. Their generation life span is 5 years. They are found at similar depths as G. fascicularis, so moderate turbulent water flow and moderate to high light is best. This is a really cool video of a symbiotic relationship! The G. cryptoramosa species has pale brown tentacles with white tips, which is what this coral may very well be. These grow up to 12" (30 cm) across and their generation life span is about 5 years. While many stores sell "Galaxy Corals" as Galaxea sp., at times noting color can give a clue as to what species they are. G. astreata is the only one currently with the description including pinks, grey, green and brown and has the common name Octopus Coral. The pink in this specimen seems obvious and it is quite beautiful! A. astreata grow 6.5 feet in diameter and each generation lives 8 years. Galaxea Coral Information: The Galaxy Coral Galaxea fascicularis was first described by Linnaeus in 1767. The Family Oculinidae of which Galaxea fascicularis belongs was first erected by Gray in 1847. The Genus Galaxea is credited to Oken in 1815. There are around 24 nominal species, about 16 of which are valid species and subspecies, with two being found around Australia. Some of them are G. acrhelia, G. alta, G. astreata, G. clavus, G. cryptoramosa, G. excelsa, G. fascicularis, G. fragilis, G. hexagonalis, G. horrescens, G. irregularis, G. lamarcki, G. longisepta, G. musicalis, and G. paucisepta. Other names this coral is known for are Star Coral, Crystal Coral, Brittle Coral, Starburst Coral, Scapel Coral, and Durian Coral. Galaxy Corals are commonly imported from Indonesia and they have been propagated in captivity. Galaxea Coral Habitat: The Galaxea genus are found at depths of 9 to 82 feet (3-25 m) in areas of the reef that are protected from strong waves. They are common in many environments, and often dominate inshore fringing reefs to the exclusion of all other corals. The G. fascicularis has very strong stinging tentacles to help capture small prey and to defend themselves against predators. What do Galaxea Corals look like: The Galaxea genus are massive with mostly columnar or encrusting forms, but shapes that include spires and branches are also sometimes found. Their lightweight skeleton consists of groupings of branching tubular corallites connected together by tiny little bumpy plates. The outermost parts of this formation is then covered in living tissue. Their corallites may or may not stand out from the base but they have long, delicate saber-like septa that can easily break. Interestingly, many of the growth formations are caused by boring creatures such as the Date mussel Lithophaga, which cause large colonies to break apart and develop sub-branching growth forms. Galaxea corals comes in are green, red, brown, gray, and pink, as well as mixtures of these. The outer tentacles extending from each corallite tend to be clear or translucent, becoming more opaque toward the center. They are often tipped in white, or sometimes a lighter variation of their colors. The polyps range in size, up to 6mm in diameter, and tentacles are often extended during the day. Long sweeper tentacles, up to 12" (30 cm), come out at night. In the wild, Galaxy Coral G. fascicularis colonies grow up to 3.3 feet (1 m) across. In captivity, It is usually ball or dome shaped and can have irregular edges. Another formation is short with wide branches. G. fascicularis generally are green, brown, and red, but can be a mix of these colors, most often with white tips. This coral has clear to translucent sweeper tentacles. Galaxea Coral Feeding: The Galaxea corals, like other large polyp stony (LPS) corals, have developed several feeding strategies. Through a symbiotic relationship with a marine algae, known as zooxanthellae, they receive many of their nutrients. They also capture planktonic organisms, food particles from the water column, and can absorb dissolved organic matter. In captivity, filter feeding/Invert food should be offered as well as bits of shrimp and fish. The Galaxy Coral can be fed small zooplankton, adult or baby enriched brine shrimp, mysis, or similarly sized food. Feed as needed, typically when the sweeper tentacles are extended. A well-feed live rock/reef environment is what is needed for your Galaxy Coral, along with some fish for organic matter production. A mature tank is recommended. The Galaxy Coral likes a low to moderate water flow and medium to bright light. Don't house them in a crowded aquarium with many other corals unless you can provide 12 inches or more between the Galaxea genus and other sessile invertebrates. Care must be taken in regards to its placement in the tank and the water flow around it as the sweeper tentacles, which will stretch in strong currents. These tentacles have a strong sting and it can do great harm to other corals within its reach. G. fascicularis is an aggressive coral which will easily damage its neighbors with its stinging sweeper tentacles. It has sweeper tentacles that can be up to 12" (30 cm) in length. They come out at night and pack a pretty strong sting, so space from other corals accordingly. Lower water flow over the coral can help prevent the tentacles from forming longer thinner sweepers. Keeping the Galaxea genus fed is also a good way of keep them from "searching for food" with those little stingers. The Galaxea genus have many commensal creatures that live between the polyps. These can be crabs, mussels, sponges, and shrimp. It is actually quite a privilege to acquire a Galaxy Coral with these creatures. The Galaxea genus have male and female colonies. The female colony forms red eggs. Then a hermaphrodite colony emits sperm that attached to buoyant, faux egg-shaped structures. These little sperm and fake egg duos then float up and fertilize the female's true red eggs. Galaxea genus reproduce asexually as well. The G. fascicularis has been propagated in captivity. Propagation has occurred in aquariums by fragmentation. To propagate, use a wire saw blade and cut into even segments. These segments will easily encrust, and they can also be suspended by a string or plastic wire, keeping the coral from touching any surrounding surfaces. Debris collecting on the colony, so keep the areas in-between the polyp heads clean with a turkey baster. Be cautious of commensal animals and sponges on the coral. The Galaxy Corals are commonly found with both in the wild. Commensal animals can die in-between the polyps during transport, so keep the areas in-between the polyp heads clean. On the positive side, due to the wide spacing between polyps, if one polyp is infected or dying, that does not necessarily mean those close to it will die. Use a turkey baster to keep the areas in-between the polyp heads clean. Galaxea Corals for Sale: The Galaxy Coral G. fascicularis is very easy to find at pet shops and on line. Prices range from $25.00 to $48.00 USD or more, depending on size and/or color.